The AR Group thought of things that weren’t even on our radar. We look forward to turning to them for future legal and HR compliance matters. Victoria thought outside the box and made the difficult become easy with positive conclusions at an affordable price. Victoria and her group are very responsive and have been very helpful since we hired them in mid-2013. At Mi Casa TalentSource, we have appreciated the AR Group’s HR Consulting work immensely. Their extraordinary team has helped us work through issues quickly and thoughtfully. Until meeting the AR Group, I had not known of a law firm specializing in legal consulting in this way. It’s an innovative, value-add approach to helping other businesses. 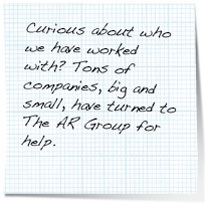 I was very satisfied with the legal services my wife and I received from The AR Group. Their product was provided in a timely manner and was very precise in meeting our needs. The AR Group has been a tremendous resource to me. I was recommended to them and they have been extremely valuable with my unique employment/corporate issue. They have exceeded all of my expectations based on their excellent strategic approach, honesty, looking out for by bet interest, and their superior legal and corporate law expertise. They are always available to assist me, regardless if it’s a weekend or late at night. I strongly recommend them and wouldn’t hesitate to use them as a legal resource again. Victoria has done a great job in looking at the scope of the problem in my organization and gives realistic solutions. She thinks globally about the organization and not just the topic at hand. I have never worried about picking up the phone to call because she does not nickel and dime me. My invoices have been fair and reasonable for the services I have received. I have had great service for my fees. Victoria is very knowledgeable and understands the business needs. From first to last moment, I felt that they were expertly knowledgable and knew exactly what the best plan of action would be and how to implement it. Tina Shepard, President & CEO - Aprendi Inc. I get a response to my call usually within a few hours but always within 24 hours. I highly value my relationship with Blair and I would feel confident recommending The AR Group. We worked with the AR Group to develop a solid service agreement for use with clients of our new company. The AR Group helped us think through things we otherwise would not have. We are deeply grateful to the AR Group for its professionalism, excellent work quality, quick turn around, and excellent customer service!